Geek Deal of the Day!!! 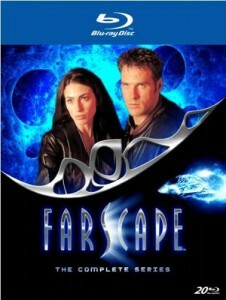 ‘Farscape’ Complete Series on Blu-Ray and DVD!!! 70% OFF!!! Cheapest ‘Farscape’ EVER!!! All 88 episodes are available on this bluray and DVD set of this scifi adventure. I just loved everything about this show. I would love for this show to come back on SYFY network. There is a big enough fan base. The set has good extras and high quality sound and video. And currently is 70% off. What a deal. Take advantage of this sale, for it ends at midnight. FARSCAPE UNDRESSED – The rarely-seen, long-sought-after behind-the-scenes special. THREE INSIDE FARSCAPE FEATURETTES: Villains, Visual Effects and Save Farscape. DELETED SCENES, DIRECTOR’S CUT SCENES, AND AN ALTERNATE VERSION OF THE SEASON 2 PREMIERE. VIDEO PROFILES AND BEHIND-THE-SCENES INTERVIEWS WITH THE CHARACTERS, CAST AND CREATIVE TEAM OF FARSCAPE. This entry was posted on Wednesday, January 18th, 2012 at 3:19 pm	and is filed under News. You can follow any responses to this entry through the RSS 2.0 feed. You can skip to the end and leave a response. Pinging is currently not allowed. « FedMex Reviews Soderbergh’s ‘Haywire’!! !